It’s starting at last. The Night Rainbow is on the move, on its way to becoming a book. And the first step is…edits. I met my editor, Helen last week to talk through her suggestions for changes to The Night Rainbow before it goes for copy editing and translation. The yellow post it notes mark pages where Helen has suggested changes. There aren’t as many as I had expected. Or should that be ‘feared’? After all this is my baby, my beautiful first novel. Or should that be ‘hoped’? Because that way, the more edits come from someone other than myself, the more accountability I can pass over to others if people don’t like what they read. Well, enough of that. You’re all going to love this book, despite the panic in my heart that tries to convince me otherwise. Helen had told me there wouldn’t be many edits, but as a newbie to all this I didn’t really have an idea of scale. I think I was expecting to be asked to rewrite whole chunks of narrative, delete or move scenes, fill in missing details in a few thousand extra words…and apparently that does happen. It can be the case, but it wasn’t for me. So what were my edits like? Helen has now read the book three times, and the main thing that she is focusing on is voice. My book has a five year-old narrator. The credibility of the novel rests on her voice being spot on. She doesn’t have to sound like child narrators in other books (and she won’t), but she does have to be believable, allowing the reader to be immersed in her story. To this end, Helen has gone through meticulously and pulled me up on a few words that she feels don’t sit well with the voice of my narrator. And guess what, she’s right. I have spent the last few days going through these changes, using my eldest daughter as a sounding board – she is now conveniently just turned 6, so is very helpful for vocabulary cross-checks – how would you describe the smell of pastry? What sound does the rain make? What has been very interesting for me as I do this is that Helen’s suggestions are sparking off ideas in my own mind about how to improve the narrative. The suggestion of one change of word has a cascade effect on the way whole paragraphs are written. The process seems very organic. I now find myself criticising the entire manuscript yet again (and believe me I did that many times before submitting it to my agent). These words are going to be printed on beautiful paper, bound and covered and marked with my name. I want it to be perfect. Can it be perfect? I doubt it could ever be, and readers probably are more forgiving than an editor, but we are making it as perfect as we can. Ooo lovely lovely. The Night Rainbow moves a little closer to rising into the sky and doing its thing. Its fascinating, the process, and I love the ‘expect/fear/hope’ description. Spot on. I am SO looking forward to this book!! You’ll be doing a blog tour, yes? Please come to mine. Would love to natter about rainbows. So it’s not just me then?! I would love to visit your blog when the time comes, thank you. And I hope you’ll consider calling this way in November? Thank you, Alberta. I will certainly take you up on your offer of a blog tour when the time comes. The generosity of the writing community keeps us all sane! How calming to read that. I panic. I have neither agent, publisher nor finished manuscript…doesn’t stop the rising tide of panic. The rising tide of panic has stopped me writing however…think I shall now just trundle on and stop worrying about perfection and imagining cross people telling me where I’ve gone wrong…post it notes don’t seem to have dismantled you! Enjoy your organic edits Claire, I very much look forward to reading your novel when it’s in print. Thanks, Elley. I’m not sure the panic ever does stop, but as you say the only way to deal with it is push through it and just keep writing. Good luck with your work in progress! I enjoyed reading about your process – and seeing the photo of the m/s out in the sun. 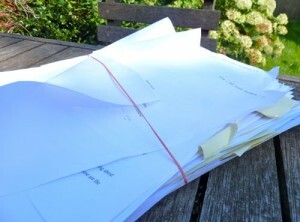 I’ve just completed the edit of my first novel and have the same sense of the book becoming slowly ever more real. I look forward to seeing your novel when it appears. Thank you! That MS has done some mileage. And now I’ve just filed it away for posterity, which feels rather strange. Good luck with your own edits! So good to have you share your journey on the way to publication. It helps to demystify the process and make it less scary. Thank you, Marisa, for having the stamina to follow me on this journey! Really useful insight for someone still at the stage of trying to find an agent. Thanks for sharing your experience, Claire, & good luck for the rest of the publication process. I have this every time I look at a picture I took. It’s really tempting to see flaws, find improvements and meddle with it because I think I’m ‘better’ now than I was when I took it. I often find I play around with it and then decide after a lot of fiddling about that it doesn’t really add that much (and to most other people it was fine in the first place). Best to go with your editor’s objectivity and trust the process. You appear to be in good hands! That’s a really good point. Sometimes the meddling can actually detract from the whole thing. The good thing with an experienced and objective point of view is that they can still see the story, not just the words. I’m so thankful to have Helen and really, for anyone no matter how they are published…get yourself an editor! The Night Rainbow is such an evocative name for a book and it sounds like it will be a lovely read. I can relate to your feelings about editing. It can be both scary and exhilerating, and definitely rewarding. I think you are right, you can only make it as perfect as you can, and once you see it, as a book, in all it’s glory, you will be so proud! I can’t wait to read it. Thank you so much for your comment, and I’m really pleased you like the title! I can feel this! I am also editing my first novel and we are near the last edit (I hope!). I also feel it has been an organic and involving experience, with the work scrubbed clean if you like. I’ve managed to have a good laugh with my editor who (thank goodness) has been tough but graceful. But I can’t wait to finish!! Good luck with yours and I do look forward to reading it! That’s wonderful to know! Tough but graceful is a great way to describe a good editor. Perhaps one day I should get one on here to interview what would best describe the ideal author, on receiving edits! That doesn’t look to bad! Congrats, you! The idea of a novel written from the POV of a 5-year old intrigues me. Will look forward to reading. You’re right, Catt, sounding boards are so useful. We can get so close to our own work it is hard to see the wood for the trees. Edits were well received by Helen so now it’s off to copy edits, to see all the continuity gaffs I’ve made, and get a grammar refresher! Can’t wait! I’m really glad you posted about this. As someone working on their first novel, still only dreaming of it getting to this stage, it was really good to read about what actually happens if you do get that far! I don’t think I’d know what to expect at all. Also: huge congratulations! It must be so exciting to see your book coming into flower like this.